The actor shrugs into a comfortable corduroy jacket, dons a wide-brimmed hat, and delivers the deceptively simple line: "Dear Ed." The audience erupts in applause. Not that there's anything particularly consequential in those two words but to countless enthusiastic fans of Walt Wingfield, it means just one thing: He's back! In Hollywood, the rule of thumb is that sequels seldom live up to originals. But in the stage world of Ontario Canada's Persephone Township, Walt Wingfield is consistently disproving that truism. At episode number six, what began as a "Wingfield Trilogy" has doubled its mandate and we are still waiting for the story to become mundane, boring, repetitious or, in fact, anything other than captivating, engrossing and everlastingly funny. Throughout it's 20-year run, the adventures of a Bay Street stockbroker in search of a kinder, gentler life as a gentleman farmer in the rural north-of-Toronto township have continued to live up to and even surpass the high standards set in the first one-man show, Letter From Wingfield Farm, which premiered in the Rosemont, Ont. Orange Hall in 1984. Cast in the format of a series of letters from Walt to "Ed," the editor of the local newspaper, the stories encapsulate the struggles and issues that plague us all in one form or another, striking the perfect balance between uproariously comic and heart-tuggingly tender moments. 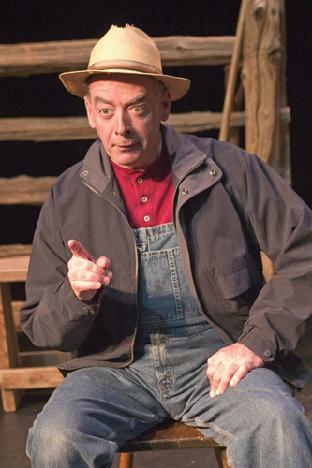 Along the way the audience has shared and empathized with Walt's efforts to learn the business of farming, while determined to stick to the old methods of horse-drawn plows and range-fed chickens, leading to the calamity of his Green Acres. We've seen him get acquainted with an array of eccentric neighbours, struggle for acceptance in his new society, and even get married, become a father and a somewhat reluctant community leader. The success of this series is due to the extraordinary talents of creator/author Dan Needles and actor Rod Beattie, who, incredibly, portrays all of the characters � a number which grows exponentially with each new production � effortlessly slipping from one to another with a change of stance, voice, facial expression or hat. Beattie, directed by brother Douglas, creates more of this magic in this latest episode, giving voice to several new characters including Walt's baby daughter, Hope, who speaks her first words. He also endows Walt with new depths of character as he embraces the responsibilities, challenges and heartaches of fatherhood. Concern over Baby Hope's chronic ear infections and evolving relationship with the family dog are fodder for Walt's ruminations on parenthood, running parallel to the larger theme of rising insurance costs, something opening night audiences at the Stratford Festival � where Walt's Inferno is premiering this summer � could obviously relate to. Walt is reluctantly recruited to chair a committee to rebuild the township's Orange Hall, virtually destroyed by fire, a task that seems to be a lost cause despite the landmark's significance as the social centre of the community, a historic site and, incidentally, the birthplace of Walt's daughter, during a snowstorm in episode five. The fact that the hall, prior to the fire, had been granted heritage designation, gives rise to an ingenious plan to collect a promised restoration grant cheque. This involves a visit by the local MP and a photo-op on a foggy night, following a circuitous tour of the area including a lengthy detour and a stop at a micro-brewery. There's also efforts to train the newest Wingfield Farm filly as a race horse even though she can't tolerate reins or bridle and an incredibly funny effort to capture a skunk who is invading the farm's henhouse. Stratford's Tom Patterson Theatre is well suited for this play, its intimate seating wrapping around the stage and nourishing the interaction between actor and audience. This was evident on opening night when Walt, having hatched an elaborate time-sensitive plan to trap the above-mentioned skunk on the eve of the autumn time change, began to set up for the line by referring to an event that happens each fall across Canada, except in Saskatchewan. Interrupted by a burst of laughter, Beattie chuckled and commented to the audience: "You're getting ahead of me." That kind of interactive relationship between actor and viewer is a cornerstone of the success of this series, which has spun off into a television series, is available on audio cassette, video and, in some cases DVD and is often presented three-at-a-time in repertory. It makes one wonder if Beattie will ever lose track of this long history and growing countryside of characters and, indeed, if anyone else could create this kind of on-stage magic. With luck we won't have to find out for some time to come and, for this season, audiences can revel in more laughs and adventures with Walt and Company. Wingfield's Inferno continues at the Tom Patterson Theatre until Aug. 14.